Looking for How to Fix (or Remake) Jam or Jelly That Turns Out Too Soft or Runny in 2019? Scroll down this page and follow the links. And if you bring home some fruit or vegetables and want to can, freeze, make jam, salsa or pickles, see this page for simple, reliable, illustrated canning, freezing or preserving directions. There are plenty of other related resources, click on the resources dropdown above. Sometimes after you have canned your jam, jelly or other preserves and let it cool, you open a jar, only to find it hasn't set properly an d is too runny! If your jam or jelly turns out too soft or runny, don't despair, and don't throw it away! It can be fixed! Here's how! If the jam is too thick, before you put it in the jars, just heat 1 or 2 cups of grape juice (or any other fruit juice of similar or neutral taste, like apple or white grape) to boiling. Then, gradually pour and stir it in until you reach the desired consistency, then continue canning! If the jars are already sealed / canned, then when you use them, just stir in a little grape juice until you reach the desired thickness. Or click here for a PDF version that prints nicely! If you want this page in metric units, click here! And Google has a great conversion calculator that will convert from any units to any units. No-sugar-needed type pectin - available at most grocery stores and big box stores and online here, at right. 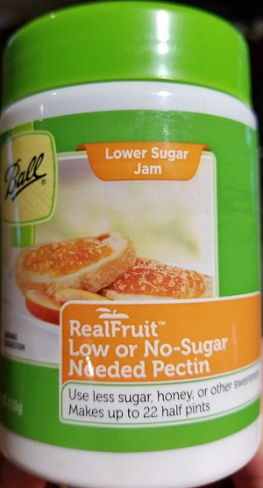 If you use regular pectin, that may make the jam or jelly too sweet! 1 box of dry pectin is equal to 1.75 oz (by weight, or 7 tablespoons, or almost 1/2 cup or 21 teaspoons). It takes 3 ingredients for jams and jellies to set: pectin, sugar and acidity. The amount of pectin that is naturally occurring in the fruit varies from one type of fruit to another and by ripeness (counter intuitively, unripe contains more pectin). See this page for more about pectin in fruit. It takes the right balance, and sufficient amounts of each of pectin, sugar and acidity to result in a firm jam or jelly. And beyond the balance of those ingredients, there are two conditions that must be met: the right amount of heat for the right amount of time. It takes a brief period (1 minute) of a hard boil, to provide enough heat to bring the three together. 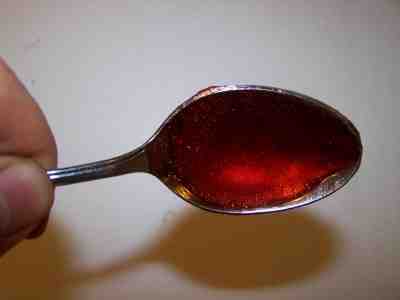 Generally speaking, if your jam doesn't firm up, you were short in pectin, sugar or acidity or didn't get a hard boil. We will correct that when we remake the jam or jelly! Finally, you CANNOT reliably make batches of jam larger than 6 cups of raw fruit (of course, but the time you add sweetener, lemon juice, etc. it will be more than that). No matter how much you stir, you won't get effective heat penetration in larger batches, so some pectin gets overcooked, while other pectin is not activated. So, to reliably fix the jam, you will need to split it into batches of less than 7 cups each. Measure the jam or jelly to be recooked. Work with no more than 4 to 6 cups at a time. Check all the jars from the batch - if one failed to set, most or all probably failed. You can check by just turning them upside down and seeing how quickly the jam or jelly shlooshes* around in the jar. Add up the volumes of all the jars to be reworked, to figure out the size of the batch (in quarts) for step 2. 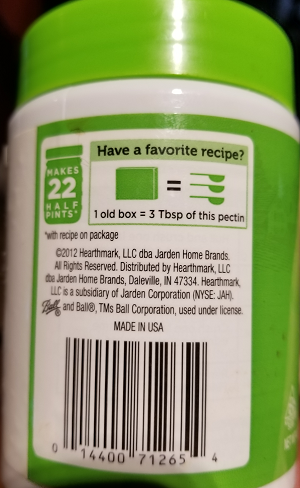 1 qt = 32 oz = 2 pints = four 8oz jars = eight 4oz jars). Open the jars to be fixed and dump them all into a large pot. Since you will probably want to reuse the jars, get the now emptied jars washing in the dishwasher. For each quart of jam or jelly to be fixed, mix 1/4 cup sugar, 1/4 cup water or white grape juice, 2 tablespoons bottled lemon juice, and 4 teaspoons powdered pectin in a large pot. So, if you made a batch of jam and have 10 eight-ounce jars that didn't set, that would be an average batch (10 cups or 2.5 quarts). For that average batch of about 2.5 quarts total, you would need 2/3 cups sugar, 2/3 cups water or juice and about 1/3 cup lemon juice, plus about 3/4 of a box of pectin, preferably the no-sugar variety. For each quart of jam or jelly, measure 3/4 cup sugar, 2 tablespoons bottled lemon juice, and 2 tablespoons liquid pectin in a large pot. 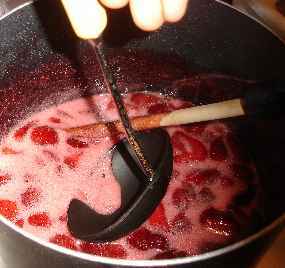 Add the jam or jelly to the pectin mixture and bring it to a rolling boil, over high heat, stirring constantly. Keep in mind that one reason jams and jellies don't set is because people try to double batches, and there is non-uniform heating. That results in some pectin becoming over-cooked and some pectin in the batch is under cooked. Never make a new batch of jam or jelly starting with more than 6 cups of crushed fresh or frozen fruit; and never try to remake a batch larger than 2.5 quarts. Once it is a rolling boil, then boil it hard for 45 to 60 seconds (1 minute). A "hard boil" is distinctly different from a "rolling boil". A rolling boil is simply the production of bubbles but is not all-encompassing and may even be stirred down. Don't "overboil" Just 1 minute of a "hard boil"
I keep a metal tablespoon sitting in a glass of ice water, take it out, shake off the water and then take a half spoonful of the mix and let it cool to room temperature on the spoon. in a minute or so. If it thickens up to the consistency I like, then I know the jam is ready. If not, I mix in a little more pectin (about 1/4 to 1/2 of another package) and bring it to a boil again for 1 minute. 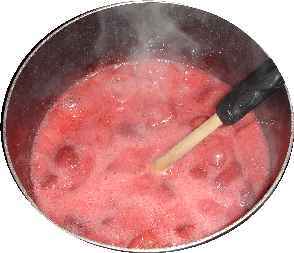 Remove from heat, and quickly skim the foam off jam or jelly. ... process as recommended in the table below. Recommended process time for Remade Soft Jellies in a boiling-water canner. If the jam was too runny, then next time you might want to add about 20% more pectin to start with, or make sure you bring to a full hard boil for 1 minute (not less, and not more than a few seconds longer). If it was too thick, add a little less pectin, and/or a bit of fruit juice before you cook it! Limit your batch sizes to no more than 6 to 8 cups of crushed fruit to start - meaning each batch should produce no more than 8 to 11 jars (8 oz each) of jam or jelly. If you want to learn more about pectin, how it works and the different types of pectin, and where to get it; see this page. Can I use Instant freezer pectin to make cooked / canned jams and jellies? See this page for the answer! A visitor writes on July 18, 2016: "Hello, I just wanted to thank you for the information on "fixing" my runny jam. I have been an avid home cook my entire life - even had a catering business in the 1980's. After several (large) batches of very runny - liquid - jam - I was ready to throw them out the window! I will try your helpful suggestions and re-make my 19 jars of blackberry jam with fingers crossed. I did not use pectin, following the recipe that was the problem! My husband keeps a farm diary on his Facebook page at Bramley Farm LLC. Thank you again for your great information! Sincerely, Pam"
A visitor writes on July 13, 2016: "Thank you. You saved my strawberry jam from becoming sauce!" A visitor writes on August 03, 2014: "The recipe for remaking worked great. Now we can officially enter it into the fair. It was a lot of work making jelly and I (like many others on your awesome website) did not want to waste the fruit. Thanks so much"
A visitor writes on July 11, 2014: "THANK YOU!! Your website and directions for how to fix runny jam SAVED me and my Strawberry jam yesterday! Originally from PA and with German heritage, my jam was definitely "schlooshing" around. I remade 8 cups (yes too much -berries very ripe) to your instructions and with a little extra pectin and we're all good! Thank you for this site and what you do here! Very helpful... Lisa M."
A visitor writes on November 03, 2013: "Thanks for your page on redoing jelly that doesn't set the first time. It saved a batch of apple jelly I had made previously. Your website is a wonderful resource for canning, especially if you are just starting out. The directions are clear and easy to understand. Thank you again for all the work!" A visitor writes on October 20, 2013: "I am new to canning so it was no surprise that I messed up my a batch of pomegranate pear jam. I knew it was too runny when I put it into the jars but I wasn't sure what i had done wrong. I found your blog and recooked the jam as you instructed and, voila!, to my great surprise and joy, my jam is now thick and gorgeous. Just thought you'd enjoy knowing you saved my jam from the bin. Thank you soooo much. " A visitor writes on September 29, 2013: "Thanks so much for your tips on how to fix runny jelly. Mom and I made some Rootbeer jelly and it didn't set up but with your tips on how to fix the jelly it saved the day! Thanks so much mom and I have used your site a lot for tips and how to's on canning." A visitor writes on September 18, 2013: "My husband and I picked a bunch of beach plums this month, and rendered several quarts of juice. My usually reliable recipe for jelly failed, and I was horrified! If you have ever made beach plum jelly, you know that it's more precious than gold! I was so thankful to come across your instructions for remaking failed jelly - it worked beautifully! Not only that, but this website is AWESOME!! Thank you so much! I've sent the page to my daughter and all of my friends who can and preserve." A visitor writes on July 17, 2013: "Made strawberry jam and it did not set properly. Followed your directions to fix unset jam and worked like a charm!! Thank you for saving my jam :)"
Comments from a visitor on November 05, 2010: "Your "How To Fix Runny Jam" worked great for me too. I made the "Grapefruit Marmalade" from the "Ball Blue Book of Preserving", but it didn't set at all. Marmalade is not usually as set as jam, but it's not liquid, which mine was. I reprocessed using your instructions and it worked perfectly, for a 16-cup batch no less. " Comments from a visitor on July 17, 2010: "Thank you for your method to fix runny jam. I used it on my kumquat jam and it worked beautifully. My three little kumquat trees bear lots of fruit and I make jam every year with more or less success. This year it is the best ever - I have never made such beautifully set jam. Wish you could taste it too. Kind Regards, Claire"